These are my favorite snacks. hehe. :) Thanks for sharing the recipe. 我通常都會烘烤整個的甜薯，切了條來焗還未試過，what a good idea, thanks Christine! The sweet potato chips taste very good. I tripled the recipe and my family of four finished them all within 15 minutes as snacks. Looking forward to more delicious recipes. Can I use the same recipe for russet potato? Is it okay if I use salt only for seasoning? Is it going to be too "plain?" 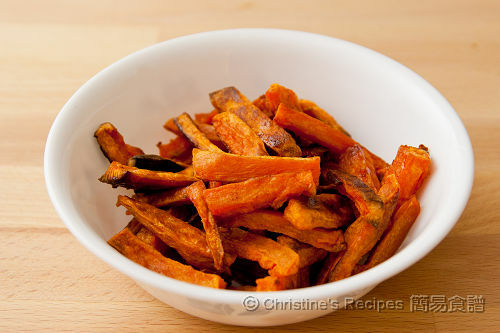 Russet potatoes are great for making chips. Mix with a bit of oil before baking, then season with salt when served.